The vegan food plate provides a simple guide to making healthy food choices, and corresponds to current scientific knowledge regarding the health effects of what we eat and drink. Endorsed by various nutrition societies and national governments, it is a more up-to-date version of the traditional food pyramid. 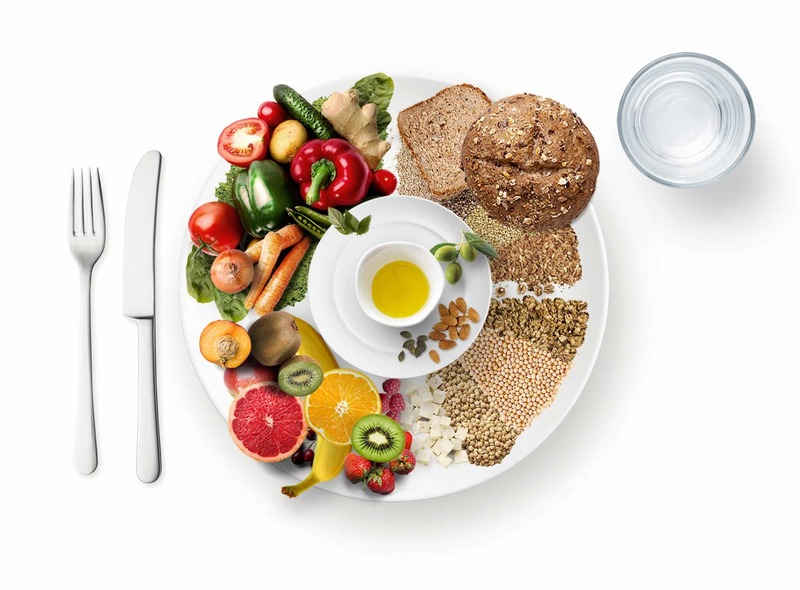 The food plate is a replacement for its predecessor, the well-known food pyramid, and was developed by nutrition experts at the Harvard School of Public Health.1Harvard T. H. Chan: Healthy Eating Plate & Healthy Eating Pyramid, Available at: https://www.hsph.harvard.edu/nutritionsource/healthy-eating-plate/ [05.03.2018] Since June 2011, the US Department of Agriculture (USDA) has been using a food plate instead of the previous pyramid model.2United States Department of Agriculture (USDA), Available at https://www.fns.usda.gov/tn/myplate [05.03.2018] The plate illustrates what proportion of each food group should be consumed per meal. The straightforward presentation in the form of a ‘healthy plate’ is intended to help consumers develop healthy eating habits with greater ease than with the previous model. Among plant foods, the main sources of protein are pulses (lentils, peas, beans, and lupins) and cereals (rice, oats, millet, wheat, spelt, and rye), as well as soya products such as tofu and tempeh. Pseudocereals (amaranth, buckwheat, and quinoa), nuts, almonds, sesame seeds, hemp seeds, sunflower seeds, and chia seeds also contain particularly high proportions of protein.6Daniel, P., Harvard University (2017): How much protein do you need every day? With every diet – whether vegetarian, vegan, or non-veggie – good planning is essential to avoid nutritional deficiencies. Optimal vegan nutrition is ensured by eating a balanced and varied diet without losing sight of critical nutrients. Nutritionists also recommend having a blood test done every year or two. Those eating a vegan diet should ensure a proper supply of vitamin B12 by taking dietary supplements and/or using vitamin B12 toothpaste. In order to meet one’s calcium needs, one should deliberately consume calcium-rich plants (for example, dark green vegetables, citrus fruits, nuts, seeds, raisins, tofu), calcium-rich mineral waters, and calcium-fortified products (for example, plant milk). According to the World Health Organization (WHO), about a third of the world’s population is affected by insufficient iodine intake. In Europe, as much as half of the population is affected.12WHO (World Health Organization) (2004): Iodine status worldwide: WHO global database on iodine deficiency. Geneva, p. 1, 12 The body can receive an adequate supply of iodine by consuming algae or algae-based supplements such as spirulina. In order to ensure a sufficient supply of iodine, iodised salt can also be added to one’s diet. However, an overdose of iodine can cause health problems. ProVeg provides further information on the topic in this article on how to prevent iodine deficiency with iodine-containing foods. Iron deficiency is the most common nutrient deficiency worldwide.13WHO (2001): Iron Deficiency Anaemia, S. 15. Verfügbar unter:http://www.who.int/nutrition/publications/en/ida_assessment_prevention_control.pdf [11.06.2018] Since the body cannot produce iron, it must be ingested in sufficient quantities through food.14Heinrich, P. C. et al. (2014): Löffler/Petrides Biochemie und Pathobiochemie. Springer, p. 659, 736–780 15UCFS Health: Hemoglobin and Functions of Iron. Verfügbar unter https://www.ucsfhealth.org/education/hemoglobin_and_functions_of_iron/ [11.06.2018] Iron deficiencies can usually be counteracted by maintaining a healthy and varied diet, and by regularly eating iron-rich foods such as sesame, red lentils, kidney beans, or tofu. Ready meals, sweets, and alcohol are not an obligatory part of a healthy food plate. They can, however, be enjoyed in moderation. Choose natural, unprocessed foods, and buy local and organic whenever possible. Ensure that you exercise regularly, engage in outdoor activities, and get plenty of sleep. 6. ↑ Daniel, P., Harvard University (2017): How much protein do you need every day?